And what we got from these questions were 308 gems of thoughtful wisdom. Each providing a keen - and sometimes unique - glimpse into the industry. Narrowing down the 308 quotes was no easy task. 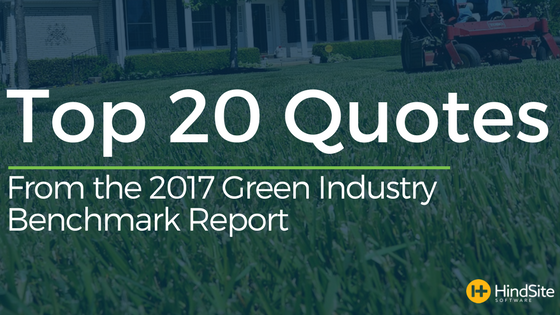 So, after much deliberation and some second-guessing, here are the top 20 quotes from the 2017 Green Industry Benchmark Report. 18. "Maintaining a solid reputation is paramount." 16. "When it comes to marketing; differentiate yourself from the competition." 15. "Never compromise your principles or values just to get work." 13. "Do your homework! Read every publication and book you can on running a successful landscape/grounds maintenance business BEFORE you buy your first piece of equipment." 12. "Sell on the benefits of doing business with your company and its associates. Never sell on price." 11. "If there is a lot of competition, I believe advertising is very important, if your market is not saturated you can cut back on advertising costs and rely on referrals and recognition of trucks and equipment." 10. "Recruit and pay appropriately the best possible employees as that is what you are ultimately selling." 9. "Do an excellent job not just of the work but becoming a trusted advisor to the client - vast majority of continuing and new work is via relationships/referrals." 8. [On what’s more important, bottom-line or customer satisfaction] "Both are important. But I'd rather lose money and have a satisfied customer than have a loud negative voice in the field." 7. Keep your marketing message clear and consistent, have a coordinated approach." 6. "Start with software from the [beginning] to keep track of bidding, operations, routing, etc." 5. "Great customer service drives a business and its marketing. The best and smartest marketing initiative won't matter if your business is notorious for being lousy." 2. "Don’t follow competitors for pricing and quality. Set your own bar, and grow at [a] sustainable pace." And the number one quote from the 2017 Green Industry Benchmark Report is one that doesn’t stop at simply offering sound advice, but rather it goes further, deliverying its wisdom in a unique, beautiful, and hilarious analogy. With 20 astute and practical pieces of advice, ranking them was a challenge. But when someone uses the "Man with No Name" to clarify their message and get their point across, there was no doubt what quote should reign supreme. If you're hungry for some more green industry knowledge, click on the image below to download the full (and free) report.